THE ART THIEF is the first novel by real life art historian and art crime expert Noah Charney. Set in London and Paris, THE ART THIEF traces the links between three seemingly unrelated heists; a Caravaggio altarpiece is stolen from a Roman Church, a valuable modern abstract painting by Malevich disappears from a vault in Paris, and a multi-million pound acquisition (another Malevich) by the fictitious National Gallery of Modern Art is nicked the night of the purchase. Inspector Bizot investigates in Paris, aided by Genevieve Delacloche, curator of the Malevich Society, whilst his counterpart, Inspector Harry Wickenden of Scotland Yard, investigates and assists National Gallery head Elizabeth van der Mier with the ransom demand received for the stolen painting. Art expert and former Carabinieri officer Gabriel Coffin travels over from Italy to track down the Caravaggio and advises Harry Wickenden about dealing with art thieves. As the novel unfolds, anonymous phone calls, obscure clues (including biblical quotes) and fake Maleviches abound as the police officers in the different jurisdictions attempt to recover the stolen art. Despite the presence of a puzzle element in the novel, the motivations of the criminals are based in the here and now; fortunately Charney eschews "Da Vinci Code" type historic conspiracy theories. One huge strength of THE ART THIEF is the fascinating insider view of the art world and of the accompanying art crime, given to the reader. I found the plot rather convoluted (exactly who is deceiving whom with which fake painting can be hard to follow). Characterisation also felt formulaic at times; the French detective is a corpulent bon viveur constantly gorging on gourmet food, whilst the English detective is a lugubrious down to earth tea drinker. 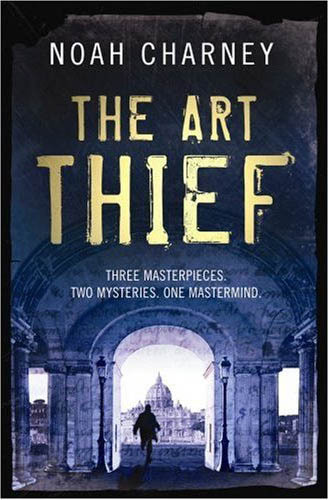 Despite these quibbles, THE ART THIEF was an enjoyable read, making a refreshing change from the high body count of the typical crime novel, dealing primarily with theft and greed rather than overt violence.